~ Daniel James Hanley's Creations For Gaming. 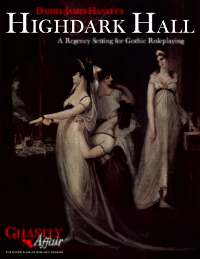 Home of the Ghastly Affair RPG. A typical country estate of the late 18th century (such as that surrounding Highdark Hall) might incorporate 1.5 to 2 square miles of land, containing a mix of farmland, cultivated woods (for lumber, firewood, and tree crops), and forest (for hunting). An aristocratic family of the period would often draw most (or even all) of its income from rents and fees paid by their tenants, as well as direct sales of agricultural products and extracted minerals. There will almost always be a body of water present on the property, whether a stream, river, or lake. At the nucleus of the estate will be a Grand House of some kind, and its parkland gardens. Besides any cottages inhabited by the grounds servants, there will typically also be a village (or two) located on the greater estate. It is common everywhere during the period for the holder of an estate to also have some legal authority over their tenants, and in Russia (and many other parts of Eastern Europe) may even actually own them as serfs. Of course, almost all such privileges were abolished in France during the Revolution. Use the following table to add color (and sow the seeds for future scenarios) when the PCs first visit an Estate House. the evidence of recent fires. evidence of recent hail damage on plants. that it seems strangely under-populated. it seems to be perfectly laid out for equestrianism, with many small ditches and low walls to jump. the shocking poverty of the tenants. the incredible prosperity of the tenants. the livestock seems to be wasting away. the odd architecture of the tenants’ cottages. a Megalithic stone circle (NW. Europe) / a ruined Roman temple (S. Europe) / human-sized stone idols (C. and E. Europe). ancient barrows (Northwestern Europe) / Roman tombs (Southern Europe) / kurgans (Central and Eastern Europe). many flattened Fairy circles in the grass and grain. the numerous stone crosses that dot the area. a bizarre fungal growth on many of the trees and stone walls. orchards growing a fruit variety you’ve seen nowhere else. the corpses of many animals that have died violently. a whole abandoned village in ruins. a strange species of flower that you have seen nowhere else. a unique breed of cow found nowhere else. a unique breed of sheep found nowhere else. a strange precession for a saint (or local hero) that you can’t identify. masked dancers wildly cavorting along the paths. another Great House, apparently abandoned and in ruins. the evidence of an ancient battlefield. there are murders of crows everywhere. the area seems oddly cool for the climatic region. the area seems oddly warm for its climatic region. the land is wrapped in mists. there are numerous roadside shrines (even in a Protestant area). packs of wild dogs seem to roam freely. the tenants of the estate are rude and unfriendly. the tenants are notably warm and friendly. the tenants seem to all be foreigners. the tenants are especially well-dressed, although nothing else about them indicates wealth. numerous cottages that seem empty, yet are kept in good repair. the tenants tend to speak and dress in an oddly archaic manner. the path seems to bustle with activity. there are numerous gypsy encampments. that you feel as if you are always being watched. that the land seems swampy, and poorly drained. that the land seems drier than normal for the climate. that the trees and other plant life seems overgrown. every bird and wild animal seems aggressive. a strange lack of men among the tenants. a strange lack of women among the tenants. a strange lack of children among the tenants. the faint sounds of singing choirs, even when there are no apparent people in the vicinity. an oddly colorful mushroom which you cannot identify, but which seems common here. numerous animal skulls and skeletons left in the fields. a body left to rot in a gibbet. a crossroads with an apparent grave in its center, protruding from which is the top of a iron spike. that parts of the estate seems have been setup to echo locations in the Odyssey. statues of Greek and Roman gods standing in the fields. the early stages of some massive construction project. a ubiquitous and delightful smell that eludes easy description. a vile but ubiquitous smell that you hope does not extend into the House. numerous colorful rocks and pebbles – evidence, perhaps of mineral wealth underground. a scream in the distance, which is suddenly silenced. the insect life seems especially numerous, and the air resounds with their buzzing. the birdsong seems strangely harsh. many new tenants seem to be moving into the cottages. several cottages whose construction had been abandoned. the tenants seem oddly indolent. the tenants seem especially industrious. fish appear to have recently fallen from the sky onto one of the fields. scarecrows dressed in antique armor. a sudden wind that carries the smell of a charnel house. the wildflowers are exceptionally profuse in the fallow fields. numerous trees that seem have been blasted by lightning. many inexplicable bare patches in the otherwise fertile land. there is an antiquarian excavation occurring. the hedgerows look especially ragged and overgrown. the hedgerows are kept exceptionally neat and clipped. there is a noticeably high amount of children playing in the fields. the image of a horse has been cut into the side of a hill. the image of a man has been cut into the side of a hill. the numerous wayfaring signs, which seem to bear no relationship with actual landmarks and distances. there are several especially dense and dark patches of woodland. the local church is oddly ornate for a country parish. an especially large burial ground attached to the church. the local church is a ruin. a striking profusion of spiderwebs, and many tree limbs wrapped in cocoons. the paths are deeply rutted, with no recent attempts at repair. the paths and roads are exceptionally well-maintained. pilgrims evidently visiting some holy site. notices posted on trees, offering a bounty for the apprehension of a local bandit. the area is teeming with large, seemingly fearless rabbits. there seem to be an especially high number of badger setts left undisturbed. the presence of a Roman road. I can’t wait to see all of these tables collected in the book! Excellent, inspirational stuff, as always. Thank you! I’ve settled on the final contents for the “A Ghastly Companion to Castles, Mansions, and Estates”. The book looks to be about 320 pages, laid out at an 8.5 x 11 size. Since it’ll take some time to illustrate, I’m considering putting out an early-access, art-free, ashcan version as soon as possible, just to get it into people’s hands. Of course, I think gamers will also appreciate seeing the illustrations of historical architectural features, types of furniture, and personal items. Really looking forward to having this one! Is there a chance you could do the early access and then an option to get the early access and the final illustrated version for a little extra? That’s the direction I’m leaning in right now. PDF and Hardcover Print Versions on RPGNow and DriveThru RPG. Softcover Print Version on Amazon. Now Available in PDF and softcover print on RPGNow and DriveThruRPG. 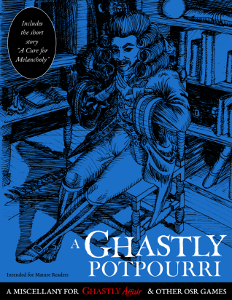 A Ghastly Companion to Castles, Mansions, & Estates - Rough-Hewn Edition Now Available!